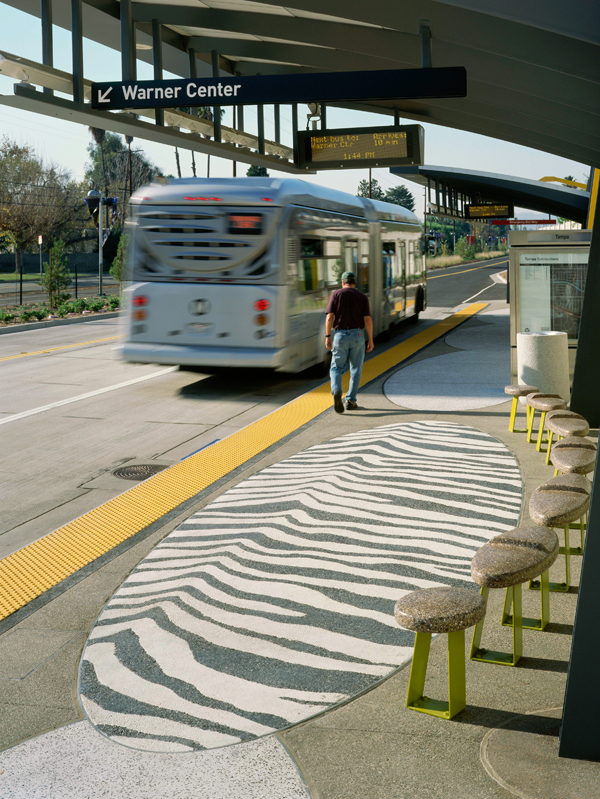 Sandow Birk designed terrazzo paving areas and porcelain enamel steel panels for station platforms. Artwork designs relate to the town of Tarzana as named after Edgar Rice Burroughs’ most famous creation and hero of more than twenty of his novels, Tarzan of the Apes. Sandow Birk selected the zebra skin and the giraffe skin as patterns, readily recognizable and identifiable with Africa, and reproduced the entire 28 chapter, 172 page text of the book “Tarzan of the Apes”. The text has been printed in two portions, one for each platform, so that over the course of repeated visits passengers can read the book in its entirety. "I would like viewers to actually be able to read the text of the book that the town was named after, and to have a longer, deeper relationship with the project and therefore with the town, the place, and with the history of the city."